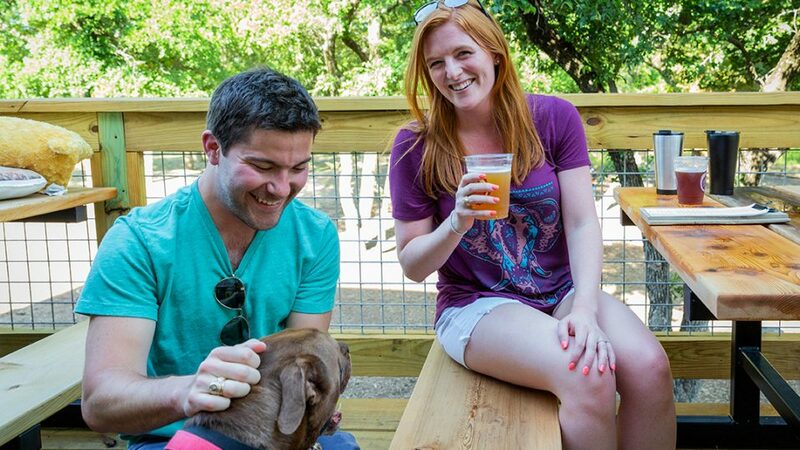 The Shacks Dining & Dog Park in The Colony embraces the concept of dog-friendly patios. Designed and developed by Billingsley Company in the 1,700-acre master-planned community of Austin Ranch, six small restaurant spaces share a large open-air patio overlooking a public one-acre dog park, named after the Billingsley’s Chief Barketing Officer, Bacon. With rolling terrain and huge oak trees, the restored and reclaimed construction of The Shacks was designed to complement the natural beauty of the area. The innovative project brings more than just a dog-friendly patio to the natural views and landscaping. It also brings a variety of restaurant concepts perfect for any group, plus regular programming in the form of live music events, trivia nights, kid-friendly programs and pet-specific events including adoptions and mobile vets. The restaurants feature an eclectic mix of dining, drinking and coffee options, from ramen and tacos, to burgers and seafood, plus a new beer and wine taproom. The last retail venue to round out the Shacks directory is Turbo Coffee, which just announced they will be joining the other tenants later this year. The first Shack to open alongside Bacon’s Dog Park was TEN Ramen, from Japanese cuisine master, Teiichi Sakurai, a James Beard Award semi-finalist. Sakurai committed to the project early in the design phase because he felt that The Shacks was something entirely new to the area. Just last month, Grrrowlers Tap Room and Beer Garden opened, featuring seasonal and local craft beer and growler fills from 25 taps. Their extra-large patio extends over the dog park and allows you to order directly from inside the dog park, so Fido doesn’t have to take a break from his playtime. And just in case the food isn’t enough of a draw, the event schedule at the Shacks is jam packed most nights of the week. Fridays bring out live music on the patio with Bacon’s Jams; Saturdays welcome a DJ and late-night fun brought to you by Dirty Burger Bar; Sunday Fundays include live music and soon-to-be announced children’s programs from Creature Teacher to Bounce Houses; Tuesday Tastings will kick off in July for a sampling from each of the Shacks, and a Trivia night will be announced shortly. Along with daily Yappy Hours, and Dog Days of Summer mobile vet and adoption days, you’ll find something going on at The Shacks most nights of the week and on weekends. And it’s all dog friendly. Memberships to the dog park can be purchased by the month or the year and provide full access to the dog park 7 days a week from 7am to 10pm. If sampling is more your speed, simply make a purchase at one of the restaurants for a daily access code to the dog park. Visiting the restaurants and dog-friendly patio does not require a membership. The dog park has separate areas for large and small breeds, and both zones include benches and play structures for pet playtime.